Below is a discussion of dry eye condition in general; if you want to read about our dry eye clinic and the in-office treatments we can provide, please click here. Dry eye occurs when the eye does not produce tears properly, or when the tears are not of the correct consistency and evaporate too quickly. In addition, inflammation of the surface of the eye may occur along with dry eye. If left untreated, this condition can lead to pain, ulcers, or scars on the cornea, and some loss of vision. 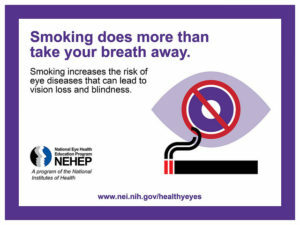 However, permanent loss of vision from dry eye is uncommon. 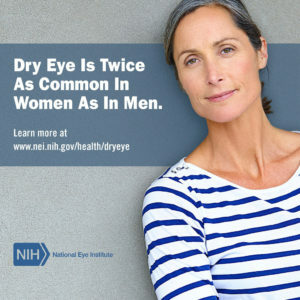 Dry eye can make it more difficult to perform some activities, such as using a computer or reading for an extended period of time, and it can decrease tolerance for dry environments, such as the air inside an airplane. What are the types of dry eye? Dry eye can be a side effect of some medications, including antihistamines, nasal decongestants, tranquilizers, certain blood pressure medicines, Parkinson’s medications, birth control pills and anti-depressants. Dry eye can be associated with immune system disorders such as Sjögren’s syndrome, lupus, and rheumatoid arthritis. Sjögren’s leads to inflammation and dryness of the mouth, eyes, and other mucous membranes. It can also affect other organs, including the kidneys, lungs and blood vessels. Dry eye conditions are treated in a step-wise approach, with a management plan tailored to each individual patient. To find out more about our dry eye clinic and our approach to treating dry eye, click here.